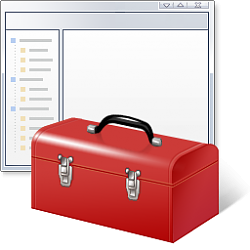 The Local Group Policy Editor (gpedit.msc) is a Microsoft Management Console (MMC) snap-in that provides a single user interface through which all the the Computer Configuration and User Configuration settings of Local Group Policy objects can be managed. This tutorial will show you how to backup and restore Local Group Policy settings on any Windows 10 Pro, Enterprise, or Education PC. You must be signed in as an administrator to be able to reset all Local Group Policy Editor settings. This will not include Local Security Policy settings. By default, local group policy settings are saved in the two hidden folders below. This is what the downloadable .vbs files below will automatically backup and restore for you. 1. Click/tap on the Download button below to download the .vbs file below. 2. Save the .vbs file to your desktop. 3. Unblock the .vbs file, and run the .vbs file. 4. Click/tap on Yes when prompted by UAC. 5. You will now have a Local-Group-Policy-Backup folder on your desktop that is the backup of the local group policies on this PC. 6. Move this folder to where you like for safe keeping. Do not rename this folder since it must remain the exact same name to be able to use it in OPTION TWO below to restore. 1. Move or copy the Local-Group-Policy-Backup folder created from OPTION ONE above to your desktop. 2. Click/tap on the Download button below to download the .vbs file below. 3. Save the .vbs file to your desktop. 4. Unblock the .vbs file, and run the .vbs file. 5. Click/tap on Yes when prompted by UAC. The script is interesting. I was reviewing the script and wondered what the ' ' SIG blah blah ' ' was for. I found through some reading that the vbscript is digitally signed, Is there a reason for this? What certificate is the script signed as? Why doesn't the script verify that it is signed? PS: I review each script and registry file. That's correct. It's the digital signature for the .vbs file so folks won't possibly get the default "unknown publisher possible dangerous file" warning when downloading. backup the group policies on one machine and restore them to the other machines? So I can be sure that the group policies are consistent across the machines? in other words all group policies have the same settings in all machines. Yes, that would be correct as long as the PCs are running Windows 10 Pro, Enterprise, or Education to have the Local Group Policy Editor. I followed your instructions for the first option and downloaded the .vbs file to my Desktop folder. The file wasn't blocked so that was a non-issue, but there was no option to run the file when I right-clicked on it - only to open it. When I did that UAC asked me if I wanted Microsoft Windows Based Script Host to make changes to my device. I clicked on Yes and all that happened was that a Local Group Policy folder was placed in my Desktop folder next to the original .vbs file. The Group Policy Folder contained three other folders - GroupPolicyUsers, Machine, and User. All 3 folders were empty and contained no backups. Any thoughts or suggestions? Thank you kindly. It sounds like the .vbs file successfully ran (opened). The backup folder would only contain backups of policies set via the Local Group Policy Editor. Double check using the tutorial below to see if you have any set. I followed the instructions, unblock, run, or open the file, but when I do so, no folders are created on the desktop. If you haven't already, you might see if refreshing (F5) your desktop may help to see the folder if created.